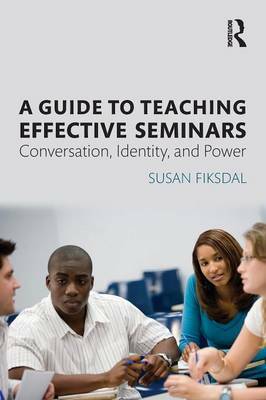 A Guide to Teaching Effective Seminars provides college and university faculty with a new approach to thinking about their teaching and helps them develop a deeper understanding of conversation itself. Seminars often inspire collaborative learning and produce rich educational environments, yet even experienced faculty find these conversations can range in quality. A Guide to Teaching Effective Seminars addresses this challenge by presenting a sociolinguistic perspective on seminars and providing instructors with best practices to manage successful seminars. Grounded in research, data, and her own deep experience teaching seminars, author Susan Fiksdal reveals ways students negotiate perspectives on reading, on conversation, and on social identities and power. By giving readers an appreciation of the discourse of seminars, the book helps to undermine stereotypes about language and people, increase civility, reduce misunderstandings, and foster tolerance for new ideas and diverse ways of expressing them. This important resource is for faculty members at all levels of experience and in every discipline who want practical advice about facilitating effective seminars. Each chapter explores a key aspect of conversation with examples from a wide range of seminars across disciplines. Transcripts from videotaped seminars showcase authentic conversations and negotiations between students. End-of-chapter best practices promote critical thinking and collaboration. A companion website features video clips of the transcripts in the book and additional resources. "If you have ever dreaded walking into a seminar room, this is the book for you. I spent more than twenty years training graduate students and lecturers to be more effective seminar leaders. I wish that I had had this book then-my task would have been a lot easier. This is a wonderful little book by an exceptionally accomplished teacher and researcher." "Fiksdal harnesses all the conceptual, theoretical, and methodological power of sociolinguistics to produce an excellent practical guide for seminar facilitators. Readers will find the book extremely useful. It's a rare book that combines utility with great intellectual depth and theoretical development."